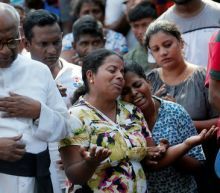 FBI agents and U.S. military personnel have arrived in Sri Lanka to assist the investigation into a series of bombings at churches and luxury hotels on Easter Sunday that killed more than 350 and injured 500, the U.S. ambassador to Sri Lanka said. Ambassador Alaina Teplitz said the U.S. had no prior knowledge of the attacks, despite local claims that foreign officials had been warned of an imminent assault. The Islamic State claimed responsibility Tuesday for the attacks through its Amaq News Agency. That protest represented a watershed moment, the point when student debt went from being a personal problem to a political one, the result of decades of disinvestment in public colleges and universities that turned education into a consumer product instead of a public good. We kicked things off with the Rolling Jubilee fund, a public education campaign that bought and cancelled more than $30m in medical, student debt, payday loans and private probation debts. Then, in 2015, the Debt Collective launched the country's first student debt strike. “It's my God-given right to be here,” said one balaclava-clad militia member who gave his name only as Viper. Chafing at the hostile reactions to the militia's actions, he said that he was an Army veteran and that he expected his group, if pushed out, to set up camp in another location along the border. “The guys in Washington say one thing about not wanting us on the ground, but no one from the Border Patrol here has ever told me they don't want our help,” he said, squinting under the midday sun. 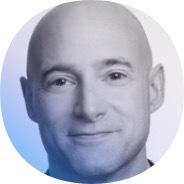 Comedian Volodymyr Zelensky's election will see Ukraine led for the first time by a president of Jewish descent, in a landmark for a country with a long history of anti-Semitism. The 41-year-old actor won a landslide victory against incumbent Petro Poroshenko on Sunday. Ukraine already has a Jewish prime minister, Volodymyr Groysman, also 41, and who is to remain in office pending parliamentary elections scheduled for October. 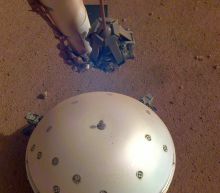 NASA's InSight lander has picked up a gentle rumble at Mars, believed to be the first marsquake ever detected. InSight's quake monitor recorded and measured the faint signal April 6, and scientists announced the finding Tuesday. The Paris Institute of Earth Physics' Philippe Lognonne, who's in charge of the experiment, said it's exciting to finally have proof that Mars is still seismically active. A Memphis man was arrested this week and faces deportation after police say he beat a four-month-old to death after learning the child was not his biological son. Jared Kushner on Tuesday said he believes the investigations into Russian interference in the 2016 presidential election have been “way more harmful to our democracy” than the interference itself. 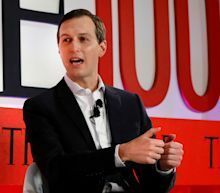 “If you look at what Russia did, you know, buying some Facebook ads to try to sow dissent, it's a terrible thing,” Kushner, President Trump's son-in-law and White House senior adviser, said during the inaugural Time 100 summit here. 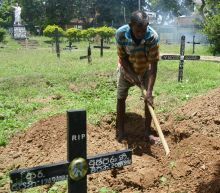 Piyasri Gunasena rarely digs more than one grave a day at the Madampitiya cemetery in Sri Lanka's capital. On Tuesday, two days after the deadly Easter bomb attacks, he had dug 10 by mid-afternoon. "This has been the busiest time -- even during the war, it wasn't so busy -- only the odd funeral for a soldier," he said, referring to the country's bloody and decades-long Tamil insurgency. 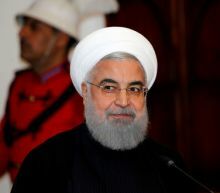 Iran is willing to negotiate with America only when the United States lifts pressure and apologizes, Iranian President Hassan Rouhani said on Wednesday, according to state media. Oil prices hit their highest level since November on Tuesday after Washington announced all waivers on imports of sanctions-hit Iranian oil would end next week, pressuring importers to stop buying from Tehran and further tightening global supply. quot;We have always been a man of negotiation and diplomacy, the same way that we've been a man of war and defense. 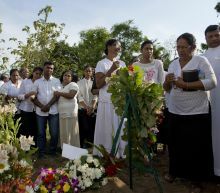 PIJIJIAPAN, Mexico – Central American migrants hoping to reach the U.S. are finding a much tougher trek than those in previous caravans, meeting unwelcoming townsfolk and a surprise raid by Mexican police and immigration agents who detained hundreds in Mexico's south. While their compatriots were been taken into custody Monday, hundreds of other migrants scrambled away into the brush along the highway in Chiapas state to elude authorities. Many had already learned they would not be received in towns with the same hospitality that greeted previous caravans, and now they know they won't be safe walking along the rural highway either. 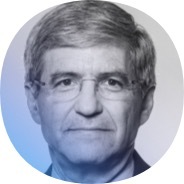 The chief investment officer at JPMorgan Asset Management said money managers are sitting on too much cash and should be boosting their allocations to high-yield assets after the Federal Reserve's dovish pivot. The firm is putting its weight behind emerging markets as investors from BlackRock Inc. to Fidelity International warn of a break in the rally. 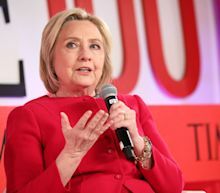 Special counsel Robert Mueller's two-year investigation concluded that the Russian government interfered in the 2016 election “in sweeping and systemic fashion” in an effort to boost Donald Trump's presidential campaign — and to disparage Clinton. 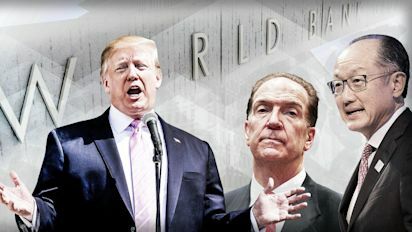 A redacted version of Mueller's report, released last week, found no conspiracy with Trump's campaign, and drew no conclusions about charging Trump with obstruction. Clinton said Congress needs to see the full, unredacted version. The decision to tighten sanctions on Iran will have "no material impact" on oil prices given the large US supply of petroleum, White House economic advisor Larry Kudlow said Tuesday. "We are a country awash with oil and gas," Kudlow said. 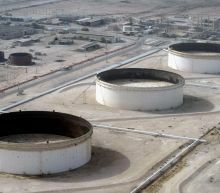 World oil prices struck fresh 2019 highs on Tuesday after the US cracked down on Iranian oil exports. CBS Corp on Tuesday said it had suspended its search for a new chief executive and extended the role of its interim CEO Joseph Ianniello until the end of the year, renewing speculation the U.S. media company will seek to merge with peer Viacom Inc. Ianniello, who was previously the company's chief operating officer, became interim CEO in September after the CBS board ousted then-CEO Leslie Moonves over accusations of sexual harassment and assault. Ianniello's interim role included a clause stating that if he was not named permanent CEO by June 30, 2019, he could leave the company with severance estimated to reach $70 million, according a source familiar with the matter. Today's roundup of the best daily deals we could find has some truly outstanding deals, but perhaps none are quite as good as the one-day sale that gets you Amazon's best-selling Wi-Fi range extender for just $14.99 after a discount and a $5 coupon you can clip. It works with any router, it has more than 20,000 5-star ratings, and it has never been anywhere close to this price! Other top daily deals on Tuesday include a terrific fast wireless charger for just $7.99, a SanDisk 128GB microSD card for $19.99, Philips Hue white LED bulbs for an all-time low of $10 a piece when you buy a 4-pack, another all-time low price for Philips Dusk-to-Dawn LED light bulbs that automatically turn on at night and off in the morning, $40 off the best-selling 8-quart Instant Pot, a $140 stand mixer that's just as good as a KitchenAid, a blazing-fast internal SSD with 120GB of capacity for under $26, Avengers: Infinity War for just $9.99, Netgear's most popular Orbi mesh Wi-Fi bundle at an all-time low price of just $159.99, and plenty more. London police are asking for images taken during the terrorist attack in Sri Lanka. Acting Commander Alexis Boon said Tuesday that counter-terrorism police want to look at any images and footage taken before, during or after the bombings. The Metropolitan Police dispatched a small team of specialist officers from the Counter Terrorism Command to Sri Lanka to support families who lost loved ones and to help with repatriation of their remains.